GaiaPro & Premium users have access to the MVUM Overlay. What about symbology for your Gaia GPS Topo Basemap? I want to know what all these symbols stand for? what about water source other than the obvious river or lake? Is there a legend for Gaia GPS Topo Basemap? No, but the icons I've mentioned above are all specific to Gaia Topo. I'm guessing the red hash marks are for restricted areas (military bases, etc. ), but would like confirmation that that's accurate. Yes, the red hashes indicate military areas. @braninr, I conferred with our resident off-roading expert, and he says it means "four-wheel trail. Use at your own risk". 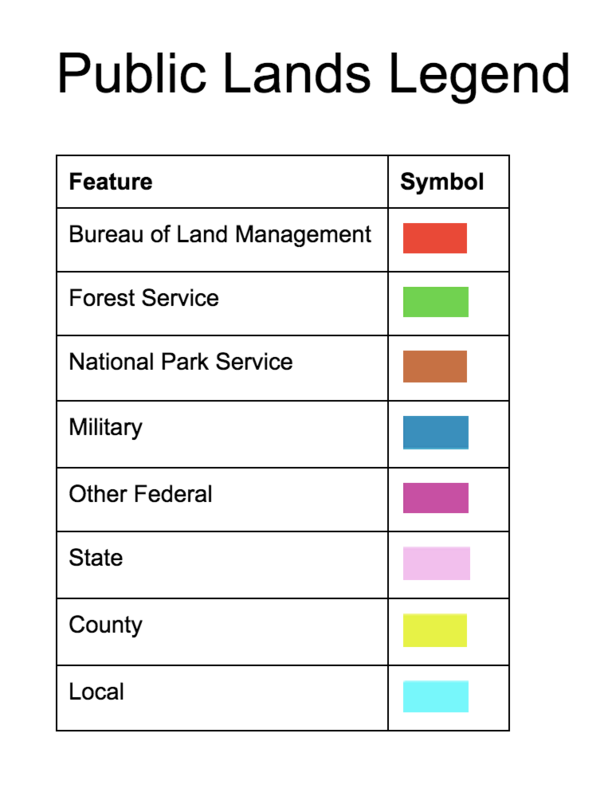 What do the grey shaded regions on nps land mean? I saw that it means building or upbuilt area, but there are no buildings in the middle of joshua tree national park, for example. @NinaRose the grey shading on Gaia Topo represents bare rock. How about the "trail charts" for NatGeo maps? I'd like to know the name of the trails and other info. Is this available anywhere? Sorry, but National Geographic did not provide us with the trail charts for maps. What do the trails with blue dots mean? The blue dots are trail markers used to designate popular trails on the OpenHikingMap HD map source. I am trying to find a legend to show me the meaning of the various solid and dotted lines near the ocean in Waikoloa, HI. I chose the the Layer,"Gaia Topo (feet)". The help.gaiagps.com page for legends has lots and lots of info, but I can't relate it to the map. Please help me find the legend for Layer,"Gaia Topo (feet)" Thanks. The colored dashed lines on Gaia Topo represent administrative/political boundaries while the black and white dashed lines represent trails. Thanks, Nathan. Is this shown on some online "Legend for Gaia Top Map" that I have been unable to find? We are working on a legend for Gaia Topo and it will be included in this article. Where can I find a map legend for Spain IGN Topo? The Map Legends article has been updated to include a legend for the Spain IGN map source. Thanks for your patience. Printed maps are not dated. Can I assume the MN indicator in the compass rose is accurate and recent (within a year)? Any idea why the info is missing for the White Mtns? Are you referring to the compass option on the gaiagps.com print preview page? If so, the magnetic north indicator is calculated for the area you have selected to print based on the current time. If you've got a specific map in mind that shows a compass rose, let me know and I can definitely investigate that for you. If you are using an Android device, you can view the category names for the Trailbehind POIs icons in the Layers menu, and tapping the icon on the main map will display the name of the POI. I have an open a bug report for the missing coverage of the White Mountain National Forest in the USFS MUVUM overlay and I apologize for the trouble. The USFS Classic and the USFS 2016 map layers do include coverage for theWhite Mountain Nationa Forest. I just got the app, so excuse my ignorance, but I cant find the MVUM overlay anywhere. Can you help me with that? The USFS MVUM overlay can be found within the Premium Overlays section of the Layers menu. Follow these instructions to find and add more maps: iOS/Android.